How did the project get started? Was it one person’s idea to start with, or did many people come up with it together? Hubber Angelia Phillips (femmeflashpoint) had a dream that she turned into a reality by gathering a handful of wordsmiths (mostly Hubbers) to write stories, including their own and those of others. This group is dedicated to the preservation and archiving of non-fiction stories related to personal experiences of phenomenal proportions. The goal is to preserve these stories so they would not be lost for the generations to come. In Autumn, 2013, the first collection was gathered and compiled by Angelia and Alastar Packer. Angelia soon discovered that a web full of editors would make the task more manageable, and those editors included Gail Sobotkin (Happyboomernurse), Vicki Warner (Vickiw), Maria Jordan (marcoujor) and Mike Friedman (mckbirdbks). The group established the headline banner of Legacy Archives Foundation and those associated with the project became known as Legacy Scribes. A Legacy Seal was designed and a web site sprang to life to showcase the contributors and to offer a place to promote the book series. There is a strong affiliation of writers, both past and present, that wandered the halls of HubPages for many years. The core worker bees of the Legacy Archives Foundation currently contribute to HubPages, and Angelia Phillips spearheaded the entire project as founder of Legacy Archives Foundation. Can you tell us a bit about your ebook publishing process? These stories were gathered far and wide. In some instances an interview was conducted and the story was pieced together from that collaboration. The stories were drawn from both experienced writers and from oral history. The process of an editing baton-passing procedure formed, and each story was ultimately reviewed by four editors. Both Mysterious & Miraculous Book I and Book II are formatted for Amazon Kindle. The Kindle format appears to be the front runner in the race to convert the written word to digital. Angelia set the deadlines for story submission. We met our goal for minimum page length on both publications, encouraging writers to contribute to our next book, if timing was difficult this time around. After much collaboration, patience and good humor, both publications were available in time for holiday gift giving. Is it true that some of the proceeds of the book sales were donated to help homeless veterans? Yes. It was voted to contribute 70% of the proceeds of Mysterious & Miraculous Book I to the K9s for Wounded Warriors Program/Rescue. This organization rescues dogs and partners them with Veterans suffering from PTSD. In essence, the program aids both soldier and animal. We are all proud of supporting this group. The remaining 30% of the proceeds go toward book printing and out-of-pocket costs to the Legacy Archives Foundation. 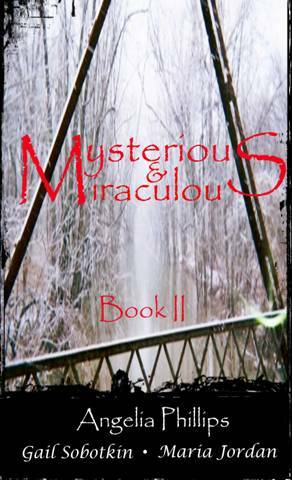 Proceeds from Mysterious & Miraculous Book II, are designated to go to the Support Homeless Veterans Organization. I understand that Book III in the series is soon to be published. Will more be written after that? There are many more stories still to be gathered and prepared for Book III. Producing two books back to back has taken much time and energy, thus a rest is in order for all involved. That said, all will agree that there are numerous good causes to support. There is no limit to the number of upcoming books in the Mysterious & Miraculous series. Our only limitation is the enthusiastic willingness of many authors to contribute their stories, as balanced with the available hours in a day! Mysterious & Miraculous Book I and Book II are both currently available for purchase. Have you had an experience of your own? The Legacy Archives Foundation is currently soliciting non-fictional work about mysterious/inexplicable or inspirational/incomprehensible personal or family incidents. Please visit the Legacy Archives website if you would like to submit a story for consideration. All photos courtesy of the Legacy Archives Foundation, used here with permission. Hello Christy. Thank you very much for this kind attention to a worthy cause. Your help in ‘getting the word out’ is very much appreciated. I certainly hope this brings the Legacy Archives Foundation some fresh stories for volume III. Excellent review! I am truly proud to be part of this meaningful project. May the L.A.F. grows from strength to strength. I also thank you for spreading the message of the Legacy Archives Foundation. Hoping writers do not hesitate to contact us if you have a story of your own or wish to be a scribe for someone else as we begin our compilation work on Book 3. Christy, you did an awesome job of bringing awareness to this project that stems from the love of ensuring meaningful stories continue on for eternity and the deep rooted passion we contributors have for our veterans. It would be awesome to see more Hubbers join in this creative effort! It was such a pleasure to write for such a worthy cause. I am proud that I was able contribute to such a worthy cause. Your blog writing expalins the whole process very well. Thanks for writing about this project on this blog. Thanks so much for spreading the word about the Legacy Archive Foundation and the Mysterious & Miraculous Book series. I hope this blog post encourages other hubbers and writers to submit true stories for Mysterious & Miraculous Book III. This shows what wonderful people hubbers are! Generosity and compassion top the list of attributes hubbers possess. I hope this wonderful idea continues and grows. Great article on this amazing book series.I feel honored to be a part of this amazing en-devour. I could not be more excited and proud. This group of writers are certainly to be congratulated and supported. To see the dream of “Mysterious and Miraculous,” become a reality, and one that is sure to continue and flourish…..makes my heart sing. I am so proud of each of you individually and the works you have compiled as a group……. Congratulations for a job well-done and the proceeds you’re contributing to selected charities/foundation!